A backyard swimming pool can provide hours of cool, refreshing fun with family and friends during the hot summer months. However, spas and swimming pools can also be quite dangerous, especially for young children. All of these tragedies may be preventable. It might be wise to share these safety tips with family, friends, neighbors, babysitters, and anyone else who may be supervising the pool or entering the pool area. 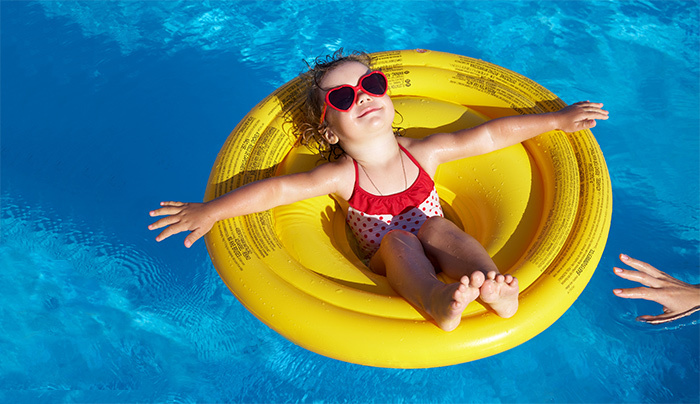 Never leave a child unattended around a pool, spa, bathtub, or any body of water. Have a phone available at all times when supervising or visiting a pool or spa. But don’t let it distract you from watching young swimmers. If a child is missing, look in the pool or spa first, including neighbors’ pools or spas. Install a 4-foot fence around the perimeter of the pool and spa, including portable pools. Use self-closing and self-latching gates. If your house serves as the fourth side of a fence around a pool, install and use a door or pool alarm. Maintain pool and spa covers. Ensure that any pool or spa you use has safety-compliant drain covers. Commercial facilities are required by law to have such covers, but you should apply the same standards to your own pool. For more information, see poolsafely.gov/wp-content/uploads/2016/04/pssa.pdf. Have life-saving equipment such as life rings, floats, and a reaching pole available and easily accessible. Remove glass bottles, toys, and other potential hazards from the pool area and don’t allow running or roughhousing on or near wet, slippery surfaces. Make sure that devices with electrical cords are kept well away from the water. Be aware of other electrical hazards around pools, hot tubs, and spas, such as faulty underwater lighting; aging electrical wiring that hasn’t been inspected regularly; and the use of sump pumps, power washers, and vacuums that aren’t grounded. Lighting, circuits, and nearby receptacles should be protected by Ground-Fault Circuit-Interrupters (GFCIs), which offer the best safety device to prevent electrocution. Limit alcohol use. Drinking alcohol not only can cause accidents for the person drinking but could lead to poor judgment and a lack of attention when supervising children. Here are some guidelines for handling and using pool chemicals safely. Secure pool chemicals in their original containers and in an appropriate location. Don’t leave chemicals out where children (or pets) have access to them. Open and handle chemicals in a well-ventilated area. Wear appropriate safety equipment, such as goggles or a mask, as directed by the label. Add pool chemicals as directed by the product label. Never mix different chemicals, especially chlorine with acid. Pre-dissolve chemicals only when directed by the label. Add pool chemicals to water but never add water to pool chemicals. Wait until pool chemicals are dissolved and/or dissipated before entering the pool. Be sure to notify your insurance company that you have a pool and discuss appropriate coverage with your insurance professional. In legal terms, pools are an “attractive nuisance,” and the additional risk may call for greater liability protection.5 If you own a pool, consider increasing your homeowners policy liability limits to $300,000 or $500,000. You might also purchase an umbrella liability policy that could provide extra protection for a wider range of risks. In addition to liability coverage, you should have enough homeowners insurance coverage to help repair or replace your pool if it is damaged in a severe storm or other type of disaster. Coverage for earthquake damage requires a separate policy. The U.S. Consumer Product Safety Commission (CPSC) promotes Pool Safely Pledges for children and adults as part of its Pool Safely campaign. These pledges summarize many of the safety tips stated above. If you’d like to take these pledges “officially,” you can do so at poolsafely.gov. The site includes more information on how to keep children safe around a pool. Ensure that all permanent pools have a proper fence and gate and safer drain covers.